So you've just finished the Getting Started document and now you're looking to find out more. 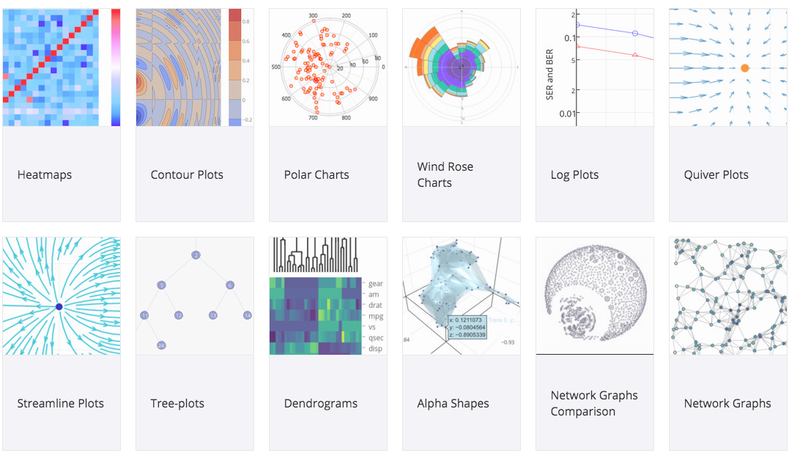 In this guide, we'll go through some of the internals of Plotly, as well as some tips and general practices that will allow you generate amazing data visualizations in no time. We can see that the figure that we're plotting with py.iplot is actually just a dictionary-like object. Moreover, we can customize and alter this plot simply by adding/defining the values of the possible keywords associated with scatter plots. Let's say we want to change the title of our scatter plot to Plot update, while at the same time, make the scatter plot blue instead of red. Moreover, Plotly plots are interactive, meaning you can manually explore the data by panning, selecting, zooming on the graphing surface (among other possible actions, try panning the axes!). We are also continually expanding the expressiveness of the Plotly package so we're able to graph and visualize all sorts of data. In no time you will be able to figure out how to make plots the way you want them, and with the information that you want to be shared with those you want. For example we can take a quick look at how we would define the objects required to generate a scatterplot comparing life expectancies and GDP Per Capita between two different continents. Hopefully this gives you an idea how plots are created with the Plotly Python Library. We'll go into more detail regarding the different parts that make up the plot in later sections. But for now, I hope you can see the customizability that's possible, and how we can define these graphs programmatically. The Python API is a package designed to interact with the Plotly.js library in order to allow Python users to create plots in their preferred environment. This way, the package will provide functions and graph objects that will simplify the process of generating plots, which would amount to properly defining keywords in a JSON object (as seen above). To this end, the Python API provides functions and graph objects which will allow us to create our plots functionally. So let's break this down. These are the two main modules that we will need in order to generate our Plotly graphs. plotly.graph_objs contains the functions that will generate graph objects for us. Note: If we examine the code from the example in the previous section, we can see these parts in action. defines a trace producing a scatter plot. Moreover it defines the data that we want plotted, which are 3 data points (1,4), (2,5), (3,6), as well as a miriad of specifications related to plotting this data. In this example we wanted the points to be plotted as hollow x's with lines joining them, all in red. In addition, we can add another Scatter object to our data list. We can do this by defining a new Scatter object, and including this in our definition of our data object. We added a plot title as well as titles for all the axes. For fun we could add some text annotation as well in order to indicate the maximum point that's been plotted on the current plotting surface. Let's add a rectangular block to highlight the section where trace 1 is above trace2. Of course, all this can be found in the Layout section of the Reference Page. Finally, we get to the figure object. go.Figure just creates the final object to be plotted, and simply just creates a dictionary-like object that contains both the data object and the layout object. After viewing the outputs of these functions (ie: the objects), we can see that they are just lists or dictionaries. But they're a little more than that. Though they do inherit properties from dictionaries (traces, and layout) and lists (figure), they provide a bit more functionality as we'll soon see. Not to mention the fact that it's much simpler to create plots in this functional fashion compared to manually writing up a dictionary. The first neat option about using graph_objs is that you can call help on them. |  Run `<figure-object>.help(&apos;attribute&apos;)` on any of the above. |      Add a data traces to your figure bound to axes at the row, col index. |      plotly.tools.make_subplots and can be viewed with Figure.print_grid. |      :param (dict) trace: The data trace to be bound. |      :param (int) row: Subplot row index (see Figure.print_grid). |      :param (int) col: Subplot column index (see Figure.print_grid). |      Flattening may increase the utility of the result. |      Print a visual layout of the figure&apos;s axes arrangement. |      Create a pandas dataframe with trace names and keys as column names. |      Dynamically return the existing and possible attributes. |      Python only calls this when key is missing! |      Calls __missing__ when key is not found. May mutate object. |      Mimics defaultdict. This is called from __getitem__ when key DNE. |      Validates/Converts values which should be Graph Objects. |      Recursively remove empty/None values. |      Return a predictable, OrderedDict version of self. |      Print help string for this object or an attribute of this object. |      :param (str) attribute: A valid attribute string for this object. |      :param (bool) return_help: Return help_string instead of printing it? |      Recursively strip style from the current representation. |      style, but with an array as a value may still be considered data. |      :param (int) level: The number of indentations to start with. |      :param (int) indent: The indentation amount. |      :param (str) eol: The end of line character(s). |      :param (bool) pretty: Curtail long list output with a &apos;..&apos; ? |      :param (int) max_chars: The max characters per line. |      method provided by Python&apos;s dictionaries. |      Everything is cast into graph_objs. Here for backwards compat. |      Everything is *always* validated now. keep for backwards compat. |  Run `<scatter-object>.help(&apos;attribute&apos;)` on any of the above. As you can see, calling help shows us all the attributes that the Scatter object takes as paremeters. Also because the scatter object is based off of a dictionary, you can see all the different methods that are attached to this object as well. For example, we've seen the use of the update method above. Focussing more on the parameters, we can see that the objects have key-word/name validation. What this means is that it'll raise an exception that provides us some detail of where we went wrong. Run `<scatter-object>.help(&apos;attribute&apos;)` on any of the above. As you can see, it tells us that markers is not a key in scatter. Instead as we browse the list, we see that what we wanted was actually marker (singular, without the s), which is a keyword. Thus this little feature makes for much easier debugging and correction. Now let's talk about the methods that come along with these objects. The one of most importance would be the update method. The difference here between the regular update method for dictionaries is that it allows for nested updates. Let me show you what that means. Notice that we were able to add the data as well as add the extra feature for the markers. However if we let scatter_trace be just a standard dictionary then we will not be able to just add another feature for the marker in this way. Instead, the value for marker will be replaced with the dictionary we choose to update with. Examples are one of the best ways to get started and get your feet wet. Through the examples you can get a good idea of what a certain type of plot is used for, and what can be possible with it. Moreover, the code in the examples are self-contained, meaning you can just copy and paste the code block and run it in your Python script or Ipython Notebook. But if you happen to run into an issue running the example, please let us know at our Community Forums. By examining the code, you can further understand and experience the procedure in which Plotly plots are created. Something important to look at would be the data used in these examples; Because certain plots are only able to handle certain types of data (e.g: histograms are only useful for quantitative data), you will get an idea of the limitations and purpose of different plot types. In addition, you can see the effect certain parameters have on the data visualization and hopefully give you a sense of what's possible beyond the standard/default. As an example, say we looked at two different types of plots in the heatmap and the box plots, now equipped with the knowledge of subplots, we can easily two and two together in order to put both these on the same plotting surface (for no other reason than that we can). Let's first load the packages, and then set up the data for our heatmap trace. Next we'll set up the trace object for our wind rose chart, and note I'm just copying code from the example pages for each of these plot types. This looks great, however we'd like for our subplots to be on the same plotting surface. So let's take a look at the dictionary representation of our figure, and customize it using what we've learned before. We actually see that the second boxplot has its own xaxis and yaxis. Thus we should unify it with the same axis as the first subplot. Then from the layout section, we should remove the additional xaxis and yaxis that are drawn for us. You can perform these steps seperately to see what I mean, but in this guide, I'll just show you the result of this edit/customization. Now we still have to remove the annotation for the Second Subplot title, asell as the First Subplot title, and then extend the range of xaxis1 to the entire plotting surface. And voila! We just put together some examples that we've never seen before, and customized out plot using what we learned throughout the guide! At this point you may have a good idea of how you want to visualize your data, and which type of plot you would like to use. You've taken a look at some examples of this plot type, but there are still some details that you would like to add or change. Now is the time for you to check out the Reference Page! The reference page details all the parameters that can be set for every type of plot that is possible in Plotly (ie: all the trace objects). In addition it also provides details on the possible parameters that are available to change in the Layout object as well. When you first load the page you will see a menu on the left which is segregated into Plot Objects and Layout. This exemplifies the two components of every Plotly figure. So for example if you knew you wanted to change something related to the visualization of the data, then you would look at the first section. If instead you were interested in a general aesthetic feature of the graph then the Layout will probably be your best option. Now for example, if you decided to create a scatter plot, then you would choose Scatter under Plot Objects, and that will take you to the the section for Scatter. On your immediate right you will be able to see a breakdown of the Scatter section, which includes all the parameters and sub-parameters at your disposal. So you've developed a better understanding of Plotly now, and you're starting to create cooler plots and visualizations for different projects you're working on. If you ever happen to get stuck with certain use cases or features in Plotly, you can let us know at our Community Forums. Moreover if you sign up for a Pro Plan, we also offer e-mail and intercom support as well. Finally if you think you've caught a bug or if something just doesn't function the way it should, you can create an issue on our Github Repo.